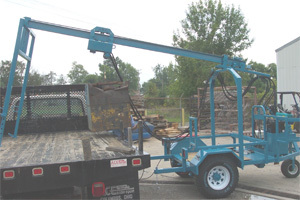 Allows automatic control, by push button: extension of beam and back legs of the handler over the hole; movement of the trolley, or hoist car, moving the vault off the handler; and operating the winch to lower it into the ground. 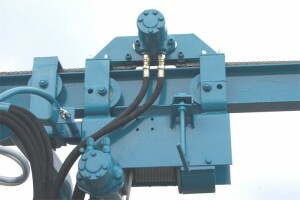 Makes everything single operator push button controlled with no cranking, pushing or handling by the operator. Operators who do multiple interments per day; setting vaults quickly, efficiently and safely. Saves time and effort and one operator can perform all functions with ease.